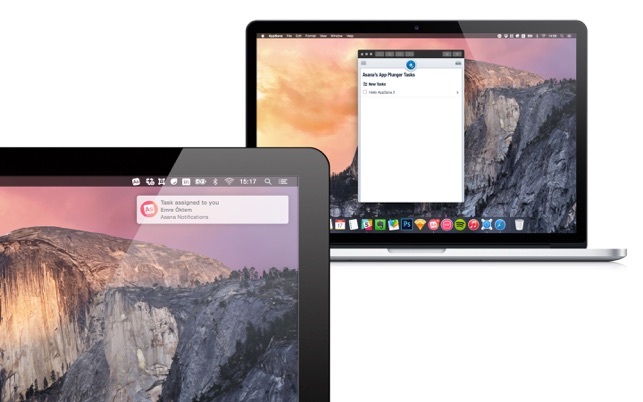 AppSana is a smart app that integrates with Asana. 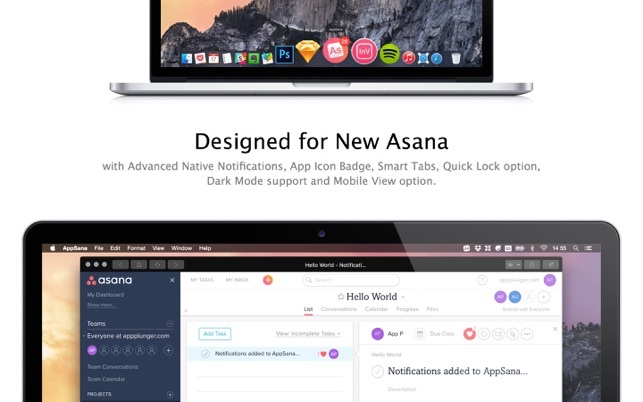 Designed to be the perfect client for Asana with Native Notifications, App Icon Badge, Smart Tabs, Screen Lock option, Dark Mode support and Mobile View option. 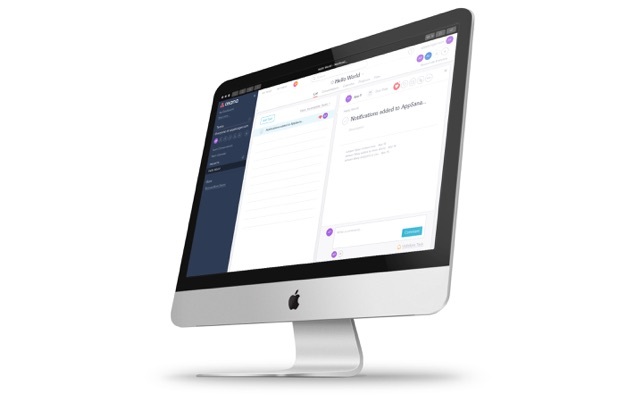 You will be informed with clean and optimised messages about every activity at your Asana Workspaces. Badge can show: Number of new tasks, My tasks assigned for today, My all tasks. For jumping light-speed between workspaces and projects. With keyboard shortcuts support. You can simply lock AppSana with a 4-Digit PIN. Protect your tasks without logging out from Asana. With a single-click lock button and keyboard shortcut support. You will make use of every pixel of AppSana. It’s retina-ready and has smooth interface with Dark Mode support. Minimalist? Use Asana Mobile with AppSana Mobile View option. * AppSana remembers the last page you have visited. * Upload files from here. * Your links will open your default browser. * Copy or share Current URL option. * Always on top option. * Home, Back, Forward buttons. And you can set your own Asana Home Page. * Fullscreen support for maximized Asana experience. My experience - it did actually work, then I kept getting a message saying I needed to update my browser for it to work, and now nothing - I go to sign in and the screen just blinks (I sign in with Google) and nothing happens. When I closed the window another window advertising the PRO version of the app was in the background…funny that! When you look through the information on the app store you see it was last updated Feb 2017, almost a year ago. Simply put, they have abandoned the app and moved on, leaving us for suckers. Yes its just a dedicated browser window. But as a heavy Asana user, the small convenience of having Asana in my dock and not confusing it with other browser windows and tabs is worth the small cost. Indeed, if the updates were a little faster I would even give it 5 stars even if it is very simple. Having used this app for all of 10 minutes, I can say it “feels” ever so slightly faster than the browser version, which for me, is worth the money. I woud also pay the money just so I can cmd+TAB my way to the App, rather than have it as a Tab or full screen window in Chrome App. I use ASANA all day every day, as does my team, so tiny improvement is a big deal. We moved to Asana from Trello when our marketing agency jumped from 3 people to 11 in 5 months, and we needed the horizontal comunicaiton, and I have wanted a native app. Let’s see if AppSana have scratched that itch - so my advice is that I would focus 90% of developer time on speed, although I can’t see how you can beet the Web feed without being native. Good job - I’ll update this review in about a month.